Have I mentioned that I LOVE Essence Trend Editions? Of course I have! In fact, I'm pretty sure that I mention it every single time they put a new Trend Edition out. A while back, I remember Essence promising us Canadian fans, after we whined that we don't get a lot of the Trend Editions that they get in the US, that we would soon be getting a Shoppers Drug Mart exclusive collection. As far as I can tell, this is it! 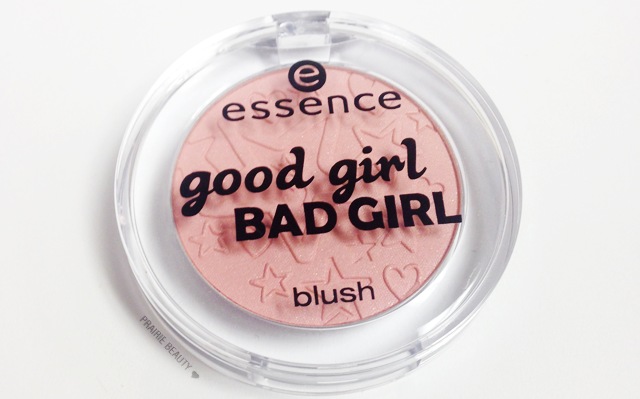 The Good Girl Bad Girl collection includes this blush, eyeshadow, lipstick, lip gloss, eye liner, nail polish and two fragrances that are intended to suit both our good girl and our bad girl sides. 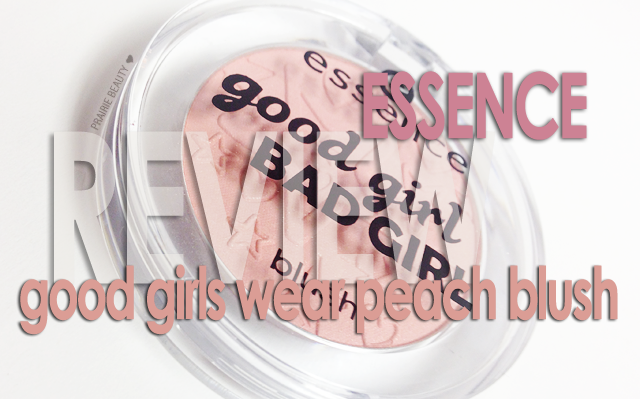 Any time Essence has a Limited Edition blush, I pick it up without question. I generally love Essence blushes, whether it's the Silky Touch formula in the permanent display or the Trend Edition ones. So... How does this one stack up? Keep reading for a closer look and review! This blush in the shade Good Girls Wear Peach is housed in a clear acrylic container that actually reminds me quite a bit of the Clinique Cheek Pop packaging, if not quite as substantial feeling. It's embossed with a really adorable stars and hearts pattern, which I think gives it the look of being more expensive than it is. Overall, I really enjoy the packaging on this and would love to see them start to use this packaging for the Silky Touch blushes. In one review, I heard this described as being similar in texture to the Silky Touch formula, but I'm going to have to strongly disagree with that. 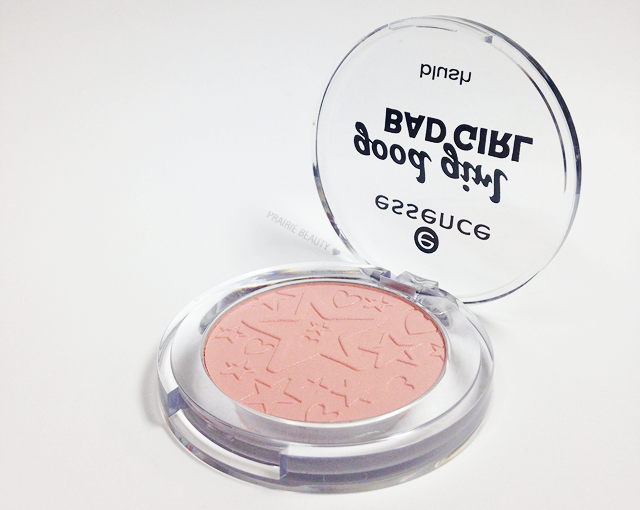 While this is a very soft powder, it's quite a bit powderier than the silky touch blushes and distinctly more dry. When I dip a brush into this product, I get a ton of kick up. This formula reminds me a lot of one of my favorite Limited Edition Essence blushes from the Justin Bieber collection from a couple of years ago. (I know...) Unfortunately, I feel like the formula works a lot better with the bright cherry shade from that collection than it does with this very pale peachy pink shade from this one. I definitely prefer the Silky Touch formula to this one. I think the biggest problem for me is this shade. It's beautiful in the pan and I even really like it in swatches, though it swatches quite a bit lighter than it looks in the pan. 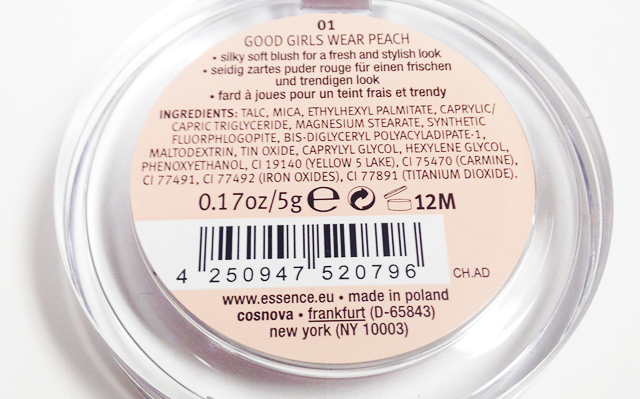 On my face, however, it just ends up being more of a subtle peachy glow than it does any kind of real pigment. 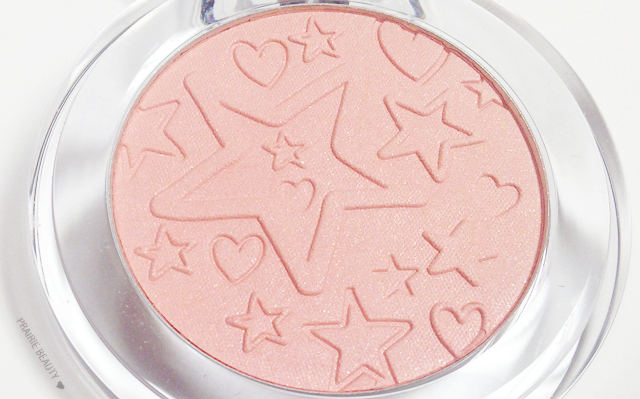 I think that this blush would work well only for very fair skinned people who like an extremely subtle glow to the cheeks. For those of us who want a blush that has a little more pop, I would choose one of the other Essence blushes from the permanent collection. So, this one wasn't a complete win for me, but I do think I'll probably use it on no-makeup makeup days when I want to add a little something to the cheeks without adding a lot of colour. And I still have every intention of continuing to purchase every limited edition Essence blush that I can get my hands on in the future!